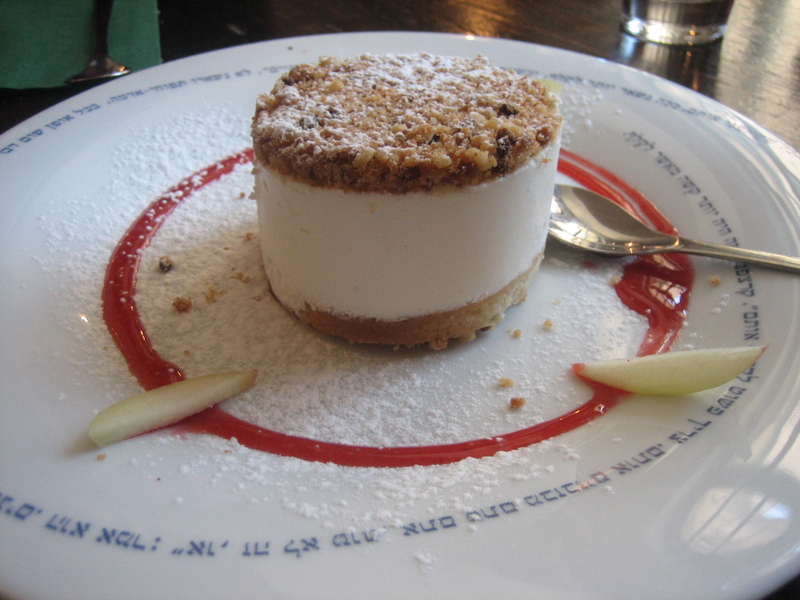 For Dining Out in Israel- Part 1, click here. My parents’ neighborhood borders Jerusalem’s bustling city center, with its countless cafes and restaurants, but I found myself enjoying quite a few meals in their neighborhood proper. A short walk from their home presents you with two options: continue straight and there’s Green, an American-style salad bar, with a tiny sitting area that can get overcrowded very easily. A salad bar lines the back half of the narrow space, and boasts a variety of fresh vegetables behind a glass front, and a half-dozen trays of freshly baked muffins teetering on the ledge above. Make a right, and there’s Latteccini, a space that has switched hands many times over the years my parents have lived in this neighborhood, and where, while the space is large and comfortable, the food struggles to keep up. During the last days of my visit, I felt an urge to stage an intervention between the two: combine the menu and the kitchen of Green with the space of Latteccini, and the time spent at the fork-off between the two would be over. But until then: at Green, you can expect to find fresh, easy salads, bagels, delicious muffins in intoxicating flavors, and when you’re really lucky: oversized chocolate chip cookies with huge chunks of Belgian chocolate. If you’re a tourist in the holy land, this venue with it’s American-style fare, and lacking any view to speak of, shouldn’t make your list; but if you’re an expat craving muffins- take note. Now, let’s make a virtual right, shall we? Latteccini, with it’s glass-enclosed patio, provides welcome shade (and air-conditioning) in summer, and rather romantic respite from the rain in winter. One night, finding the rest of our family otherwise engaged, my mother and I headed out for a cozy dinner. The pasta dishes we had were enjoyable if ordinary; I had the ravioli, while she chose the gnocchi, both were (drowned?) in a mushroom cream sauce. It was definitely palatable, although I’m not sure if it veered on the side of good because of the dish itself, or due to the luxury of being with my mother in a relaxed setting, something we don’t do nearly often enough. We shared a bottle of white wine (which arrived not chilled), which probably affected our choice of dessert: the Chocolate Sushi popped right off of the menu, and when the waitress touted it as the restaurant’s specialty, we decided to go with it. What arrived was a big round plate half-filled with whipped cream, and half-filled with a hot mess. 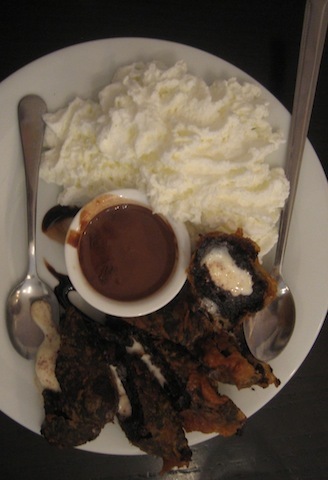 I realize that’s not much of a description, so how about this: an overly-sweet chocolate devil’s cake, stuffed with vanilla ice-cream and then dipped in tempura batter and deep fried; piled haphazardly. There are just too many things that were wrong with this. The fact that it was presented with two absurdly mismatched spoons did not help. On another visit, Y. and I shared the Insalata Latteccini, and although the ingredient list could use some editing (lettuce, red onions, cucumbers, roasted vegetables, cranberries, sugared pecans and fresh fruit in a sweet vinaigrette- whew! ), it was rather decent. Apparently decent enough for me to choose Latteccini again when my sister-in-law left her baby with my mother, and wanted to stay within a 5-mile radius. After we were told they were out of two of the salads, leaving the option of two salads that astoundingly both featured beets as the prime player, or the Insalata Latteccini, we ordered the latter again. This time it arrived with wilted greens, well past their prime, and misshapen chunks of roasted vegetables. The next time I went (and yes, there was a next time, and even another one after that; it’s proximity to home just cannot be discounted) I stuck to coffee and cheesecake. As should you. Tmol Shilshom is a used-bookstore/café tucked away on the second floor above the bustling pedestrian streets of the city center. The walls are lined with books, the furniture is rustic and mismatched, and in the evenings they host poets and writers for informal events. The menus are styled as little books, and the plates and placemats are lined with quotes. The place is charming, especially for bibliophiles like myself. I want to be as excited about the food. 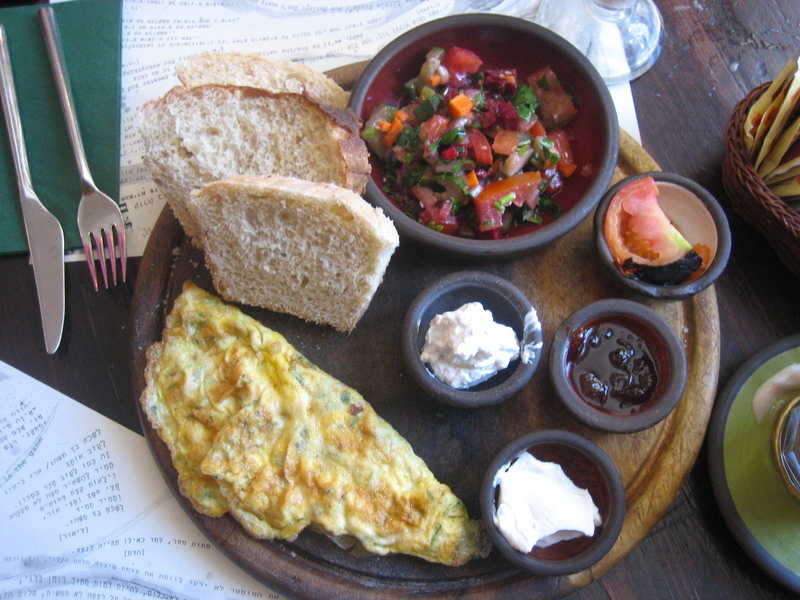 I met a friend there for breakfast, and we shared an Israeli Breakfast, which included an omelet accompanied by lackluster bread, and tiny dishes: one with jam, two with similar cheeses, and one with a char-roasted tomato quarter. Now, I’ve had breakfast there in the past, and that char-roasted tomato arrived with it. At the time, I dismissed it, thinking that the chef, lacking the ingredient that usually went into that fourth dish, had made an inspired last-minute decision to stick that tomato quarter, which was forlornly lying on the counter, right onto our unsuspecting plates. However, now that over a year later I was served that same blackened tomato quarter, I’m assuming it was intentional, and I have to hold myself back from sending them an email, which wouldn’t contain much more than: Why??? I wasn’t going to show you this picture, but seeing as I set the stage for it, here it is. As you can see, the platter also contained a small dish of Israeli salad with the unfortunate addition of chopped beets and carrots, the crunchiness of the latter emphasizing just how soggy the cucumbers were, while the former eerily bled into the mix. Again, I witnessed this same ill-fated mix at breakfast over a year ago. For dessert, (and yes, some days even breakfast deserves dessert), we shared the cheesecake. Let it suffice to say that the plate on which it was served was more intriguing than the cake itself, which is pretty much an accurate description of the food in general, as much as I wish it were otherwise. I chose to have a cocktail party with my girlfriends here, seeing as it’s located in the same hotel as my favorite café, and the pictures on the website made it look as if it was all sofas overlooking the majestic walls of the old city. You guessed it wasn’t all sofas right? It’s outdoors, and the view is indeed there, which is pretty magical, but there’s only one pair of sofas, and when we arrived, we lay in ambush for them. The bar serves the hotel, so the staff is a bit snobby, but if you can get past that, and manage to score the sofa, you’ll be rewarded with a front row seat on the view that Jerusalem is famous for. For a place that advertizes itself as a lounge, I found the lack of finger foods or antipasti platters a little disconcerting, and I scanned the menu for items we could share. Although the Beef Carpaccio was delicious, as was a mixed green salad with endives and pecans, the Baked Potatoes were a rather awkward choice. As the evening came to a close, we shared a bowl of cream puffs, filled with vanilla cream and accompanied by hot chocolate sauce, which, while generous, had hints of their previous frozen state. The chocolate mille-feuille, which arrived on a rectangular dish replete with a chocolate flourish at the end of which rested a dainty little macaron, was not only visually stunning, but boasted delicious layers of hazelnut biscuit, crispy pralines and espresso ganache. An exquisite end to the evening. 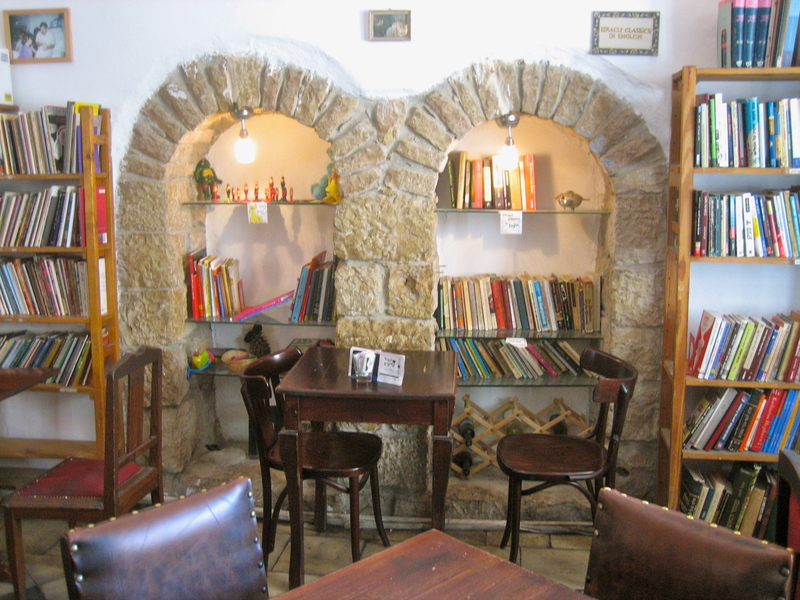 My blurry, hazy, fast-paced trip made me skip my favorite café in Jerusalem. Yet although I don’t have any recent experiences to recount, I want to make sure it makes your list. Potted herbs adorn the mismatched tables, and mosaic tiles with calming Mediterranean hues brighten the walls. At the entrance, rustic wooden tables laden with big jars of olives and pickles welcome you, and set the tone for the Mediterranean-inspired fare. The dishes, which are small, yet reasonably priced, are fresh and bursting with flavor. On my last visit, the Endive Salad, in which tall and slender whole lettuce leaves were presented horizontally and topped in a single diagonal line with caramelized pears, a drizzle of walnuts and a single slab of blue cheese, exhibited restrained elegance, and particularly stood out. The cafe is bright and spacious, with just the right amount of space between tables, so that while you sample the fresh, inspired fare, you can settle deeply into conversation.